A special discount is available to JBS members. 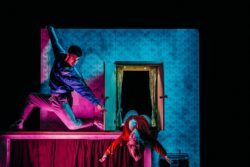 The Enormous Room is the latest stage production from the leading integrated dance company Stopgap Dance Company, which creates exhilarating dance productions with disabled and non-disabled dancers. Reserved seats only. There will be a talk session after the performance on 9th March. Please visit Setagaya Public Theatre website for further details and reservation.